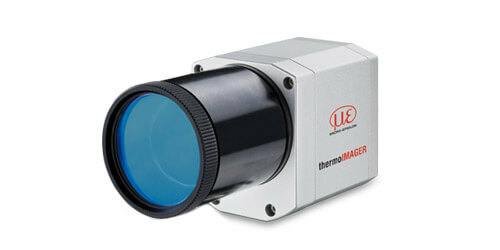 The short-wave thermoIMAGER TIM M05 and TIM M1 thermal imaging cameras are mainly used in the metal processing industry. Due to its short-wave measuring wavelength, these infrared cameras are ideal for temperature monitoring during melting, hardening and forming processes. The thermoIMAGER TIM M05 thermal imaging camera is designed for non-contact temperature measurement of molten metal and metallic surfaces from 900 °C to 2000 °C. As well as compact size, USB interface and license-free software, the new TIM M05 series features a wavelength range of 500nm to 540nm minimizing measuring errors due to unknown or changing emissivity. The frame rate of 1kHz and high optical resolution enable optimal adaption to the respective application. The thermoIMAGER TIM M1 thermal imaging camera is designed for non-contact temperature measurement of hot metals in the 450°C to 1800°C range. As well as the well-known advantages of thermoIMAGER infrared cameras such as their compact size, USB interface and license-free software, the new TIM M1 series offers several unique selling points. Compared to other thermal imaging cameras for metals, the temperature measuring range of 450°C to 1800°C is usable entirely and without sub-ranges. There is no need for any measuring range switchovers and the camera is significantly more flexible in its use. The powerful sensor electronics not only enable process thermography but also the output of temperature data of the center pixel at 1kHz and so can also be used as a pyrometer. The TIM M1 thermal imaging camera is primarily used for temperature monitoring of hardening and forming processes for hot metals but also for processing graphite and ceramics.